I tried to get out of the house today. It was snowing a bit, so I cleaned off the rental car, loaded it up with the HomeGoods items I wanted to return, and drove out of the driveway. I made it down the street — and then turned around. The roads were so slippery! Another snow day stuck at home for the three of us, but I don’t mind. I like being home with my two men. So I made gluten-free muffins with Landon earlier, and now I’m making gluten-free pasta with veggies and fake meatballs for dinner. And I took pictures of my new spring mantel. Yes, I’m willing spring into being. I’ve banished the three cute “Let It Snow” signs I display during the winter, and I want to see green! How about you? 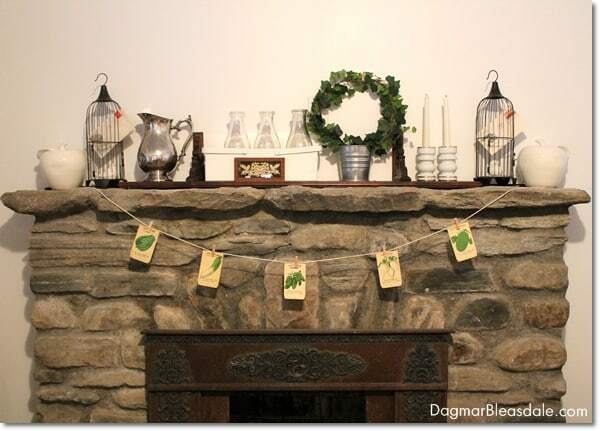 Green was my inspiration for our new mantel decor. 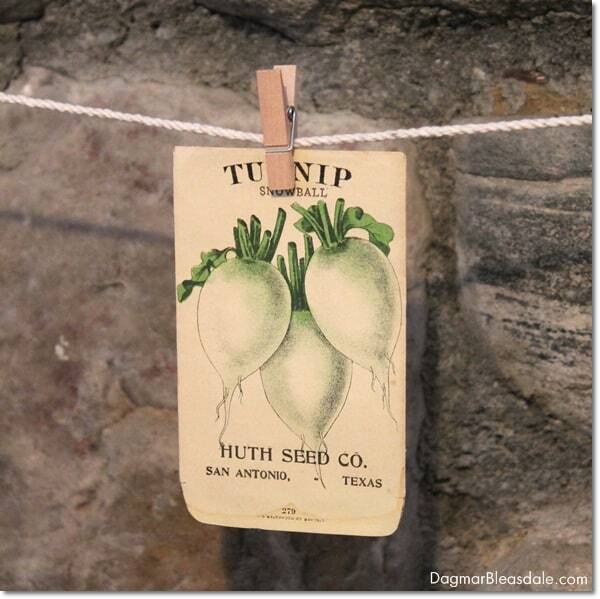 I bought these precious vintage seed packets in Cold Spring the last time I was there. I noticed them in one of the antique stores, and look, the German name of the vegetables is listed on the back. I grew up with “Gurken” in Germany. I just couldn’t walk out of the store without buying at least a few; I thought they were so beautiful. 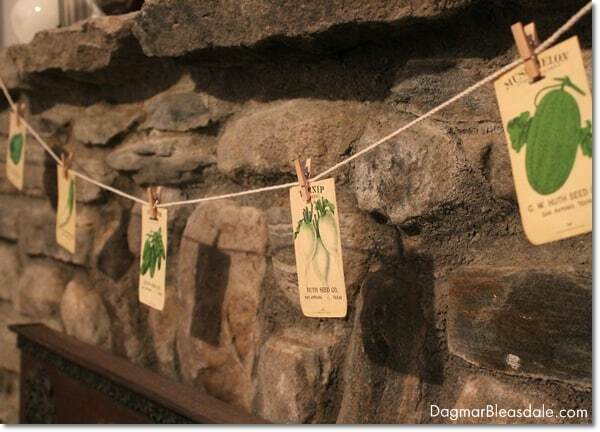 Today I put them to good use in my new mantel display and made a quick vintage seed packets banner with some string and little wooden clothes pins. Doesn’t get much easier. They are adding just the right pop of green. 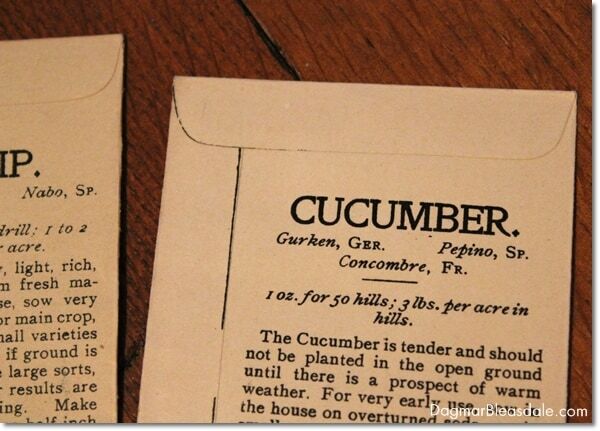 I wonder how old these seed packets are, and who added the words with a typewriter. I bought that long wooden shelf a while ago but haven’t found a good spot for it in our home yet. So I turned it upside down and put it on the mantel, and then added a few things that I had on the mantel for my Valentine’s Day decor. 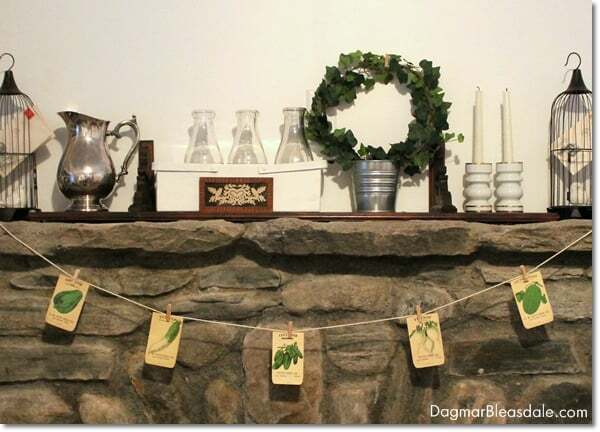 What do you think of my “spring” mantel? I guess we’re also ready for St. Patrick’s Day. Let’s see if this spring banner will melt all the snow outside. Do you make banners for your home? 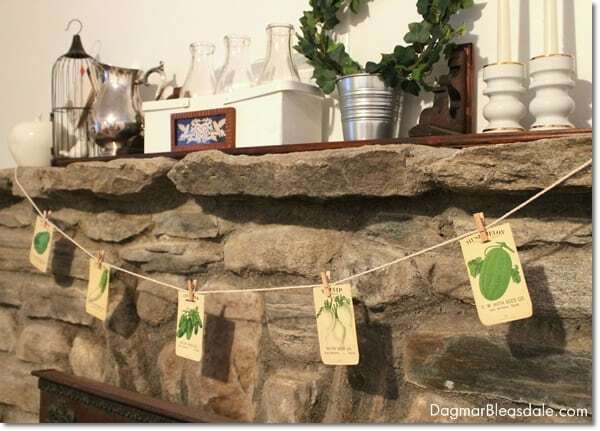 Those seed packets work perfectly with the stone on your mantel! What a gorgeous way to dress it for spring. Thanks for sharing it with us at Merry Monday! We love banners and this is so cute! 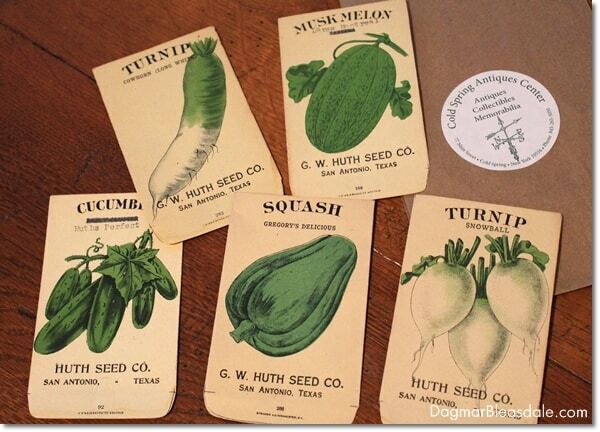 Love those old seed packets! Thanks for sharing at Funtastic Friday! 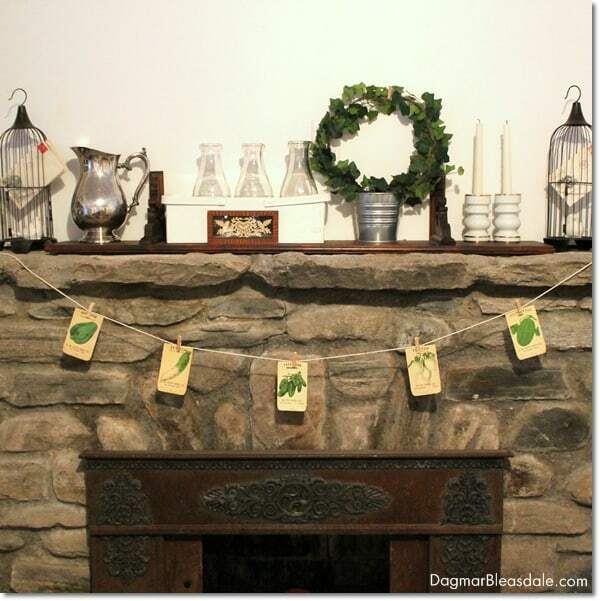 I love this mantel idea! I always have a hard time getting a clean look. I go overboard. This definitely helps! What a fun look for spring Dagmar! I love old vintage advertising of any kind. Thank you for linking with Home Sweet Home! So simple, but so cute! Thanks so much for linking up at Best of the Weekend! 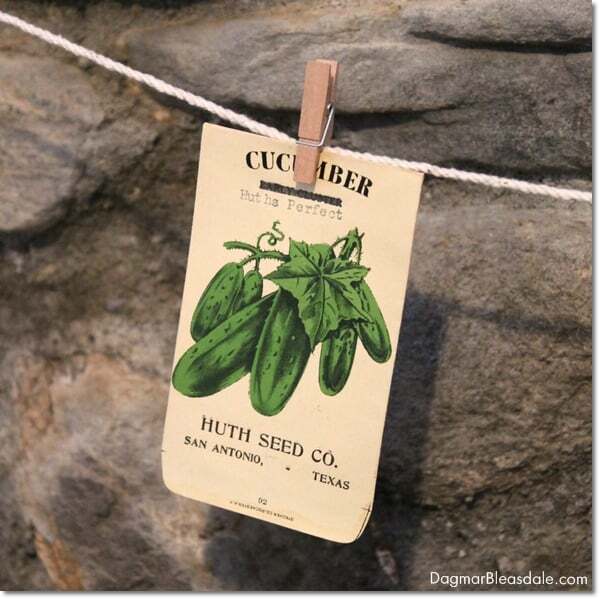 I absolutely love those seed packets! And what a cute decoration you made with them. Thank you, Audrey, for stopping by! I absolutely love this style! It goes perfectly with the stone fireplace (which I also love). We have an older home, so I’m always looking for vintage inspiration to add to it. Thanks for sharing!